AAS President Dr. Debra Elmegreen, Press Officer Dr. Rick Fienberg, and the rest of the Society were generous enough to grant astrobites a unique opportunity at the 219th AAS meeting in Austin this past week: the chance to serve as media interns, liveblogging the event, attending press conferences, and effectively trying the career of “science journalist” on for size. I’d like to take a moment to share my thoughts on the experience, as well as some advice from professionals on becoming a science journalist, as a final posting associated with the AAS meeting. First, a side note: there are many types of careers in science media, and science journalism is only one of them. I’m focusing on that role in this post, but you should know that this isn’t the only option! David Aguilar, the director of public affairs for the Harvard-Smithsonian CfA and one of the speakers at the Careers in Media session at the meeting (discussed here), is a great example of someone in science media who is not a journalist. • Science journalism is different from academic science writing. The main news always has to come first (which typically means starting with the conclusions), followed by the important details. Then you can follow up with things like background information. 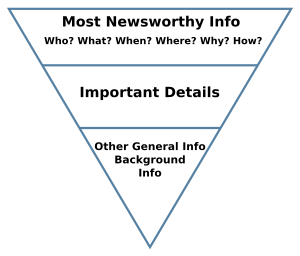 This is called “inverted pyramid” writing. • The phrase “so, in other words” is gold when talking to people about their research — both as a journalist and as a researcher. It’s a way for you to make sure you’re understanding what they’re saying, and a way for them to see their own work in a new context (namely, that which your background provides). • Science journalists are still scientists! When becoming a science journalist, you don’t magically stop being a scientist. This will help you. • Science journalism requires a different mindset than being an academic scientist — in particular because it’s so fast-paced! But the rewiring of your brain that happens in science to become critical and good at assessing evidence and drawing conclusions will carry over nicely. 1) Receiving press releases and attending press conferences is awesome. 2) Writing up live results is a very different experience than blogging for astrobites. 3) The pace of science journalism is, frankly, terrifying. There were five of us astrobiters covering this conference. In spite of this, it was a whirlwind! Every second of the time, I felt like I should have been four places that I currently wasn’t. After sessions, I’d frantically try to write — but often not quickly enough to get to the next session I wanted to attend. I can’t imagine doing this solo instead of with a team. Again, I’m sure writing quickly and dividing your time cleverly are skills that one can learn. But as someone used to the slow-and-steady pace of academia, it was quite the transition. 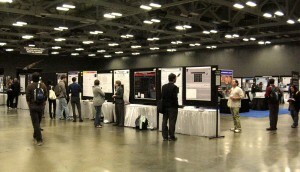 Poster displays in the exhibit hall at the 219th AAS meeting. Knowing what questions to ask also helps you to know what questions to answer when you're showing off your own poster! 4) Functioning as a journalist helped me to get more out of sessions. I found that keeping careful notes on sessions — with the goal in mind of how I was going to write this up to explain it to astrobites readers — helped me to get a lot more out of sessions (including interacting with people at poster sessions) than if I’d been passively listening. It was certainly more work, but it forced me to take an active role of understanding as I went, rather than telling myself I’d try to understand it later. Following journalistic etiquette, I was always looking for the big picture, the main results, and the implications of each work first, which helped me to fill the details into a context, rather than using the details to piece together the context later. This seems like an awesome skill to learn as a scientist, and I’m looking forward to honing it in the future! The panelists at the Careers in Media session agreed that science journalism is a very competitive field. That said, they offered some tips for getting started. 1) Start a blog. Practice can only help you, and having your name and samples of your writing on the internet will be beneficial when it comes time to find a job. 2) Sit in on journalism classes, read newspapers, subscribe to magazines. All of these things will give you a better idea of what makes up a well-written article. 3) Attend AAS meetings, as well as other big science meetings. And write them up! This is where newsworthy science gets reported, and is where you should be if you want a career reporting them. 4) Volunteer! Many of the panelists were offered their first jobs in science journalism as a direct result of having worked for free to begin with. One specific recommendation was to seek out your school newspaper, find the person in charge of writing up science, and ask to intern with them. 5) Check out the National Association of Science Writers. This recommendation came from an audience member; the NASW has a great website full of advice, as well as an active mentorship program. As a final note, I’d like to thank Dr. Elmegreen, Dr. Fienberg, and the rest of the AAS for what has been a fantastic opportunity. The best thing to do if you want to learn about a career is to try it out, and I’ve absolutely enjoyed this chance to do so! And by the way, I’ve been following your live-blogging of the meeting and I’ve been extremely impressed by it. The amount of coverage you’ve managed on your own, in spite of being those seven time zones away, is remarkable to me — I really hope that I can learn that kind of efficiency someday! Many thanks for your links to us in the process.